The Fayal School, 1940s. Photo by Sally Shea Martin. On April 25, 1911, the ten-year-old Fayal School was destroyed by fire. The wooden schoolhouse stood three stories tall and held approximately 200 students. 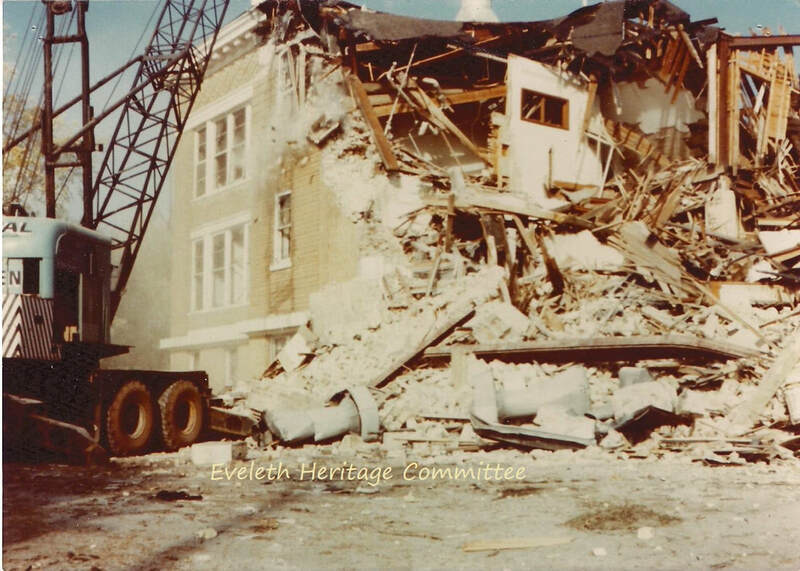 The Eveleth School Board held an emergency meeting the day after the fire to discuss replacing the burned school. The Board selected Duluth architects William T. Bray and Carl E. Nystrom to design a new—and fireproof—structure, estimated to cost $60,000. An Eveleth newspaper reported that iron ore was possibly located beneath the site of the school, but the new building was constructed on the same lot. 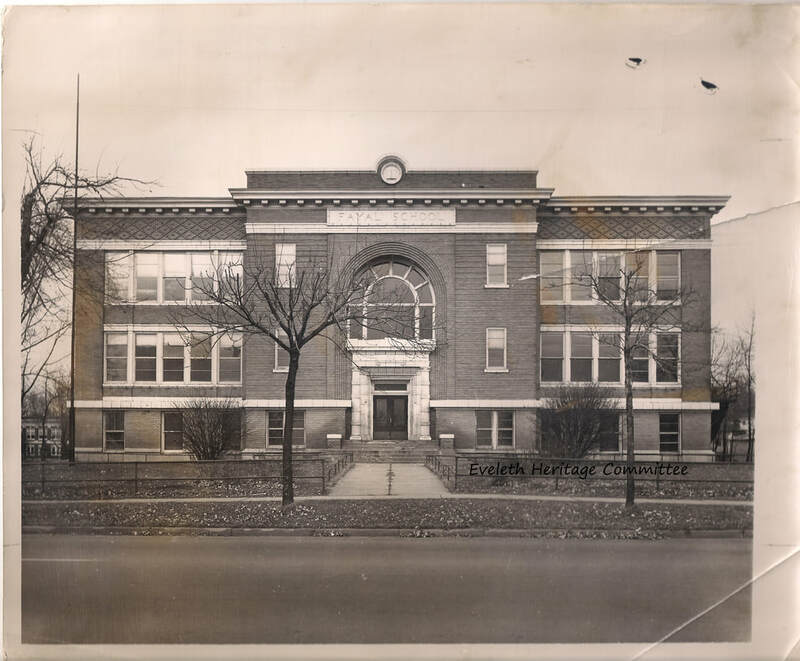 In the meantime, high school students were sent to the Spruce School just south of Carrie Avenue, and grade school students attended classes at the Fayal Kindergarten and the Presbyterian Church, which had served as the original schoolhouse for Fayal Location. Students began occupying the third and final Fayal School on Monday, February 12, 1912. The building's exterior exhibited structural elements and design motifs that can be found in nearly all of Bray and Nystrom’s other public buildings. The center of the main façade closely replicated the east and west façades of Eveleth High School, now the old Junior High. The exterior of the Fayal School was adorned with glazed terra cotta; brick diaper (yes, diaper), a repeating diamond-shaped pattern, along the top of the building; and ornate trim around the main entrance. On the school grounds were a playground and tennis courts. The new school could house 420 students, double the capacity of its predecessor. The ten classrooms had pressed sheet metal ceilings and white maple floors, and chalkboards were installed at varying heights for the different ages of children. The principal's office was on the west side of the second floor, where skylights illuminated the uppermost hallway. In the basement were the bathrooms, two playrooms, the boiler room, and a 30'x67' gymnasium, said to be one of the largest on the Range at the time. The hallways had terrazzo flooring, ornamental plaster ceilings, and marble wainscoting in the main stairwell. A marble plaque in the vestibule bore the names of School Board members, the Superintendent, the architect, and the builders. Modern heating and ventilation systems kept the building safely supplied with fresh air, and the classrooms were well-lit with electric and natural light. In August 1915, public baths were opened at the Lincoln and Fayal Schools. Bathers had to supply their own towels and soap. That same year, the first Eveleth Boys Scouts, led by D. V. West, met at the Fayal. 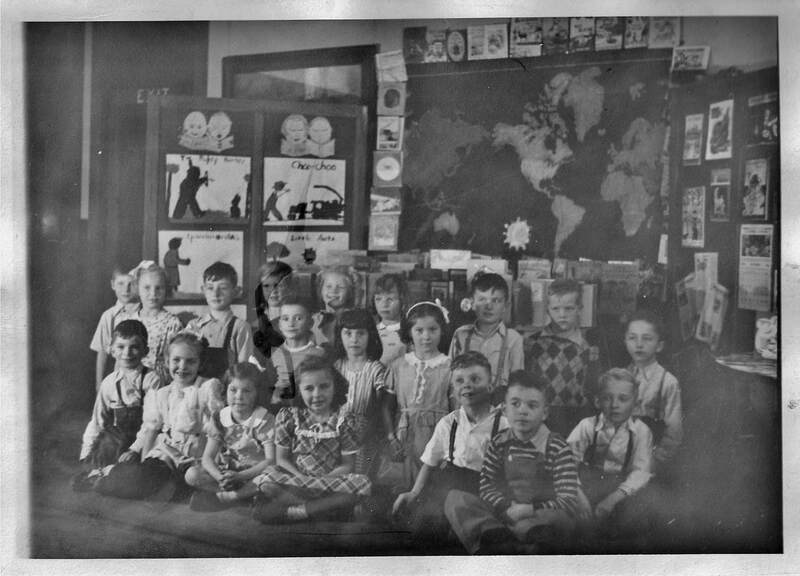 A 1944 kindergarten class at the Fayal School. Courtesy of Roger Kochevar. ​Eveleth's population began declining after the 1930 Census, and the Eveleth schools were unable to operate as they had in years past. The three wooden schoolhouses in town (the Adams and Fayal Kindergartens and the Spruce School) were closed by 1930, and the Lincoln Annex closed in 1939. In 1942, Labor Foreman Emil Brink reported to the Board of Education that the Fayal School's boilers could be safely operated for possibly two or three more years, but some repairs were needed for the coming school year. At an executive meeting in August 1942, the Board declared that "the building [would] definitely be closed" in June 1943. Four years passed before the fate of the school was settled. Along with declining enrollment, the School Board was faced with decreased funding through local and state tax retrenchment programs. In late winter 1947, the Board explored cost-cutting measures, including closing buildings. 256 students attended the twelve-room Lincoln School on A Avenue, while only 209 went to the much larger Benjamin Franklin up the hill. The Board estimated that relocating the 192 students at the Fayal School to the Franklin would save $13,000 annually. 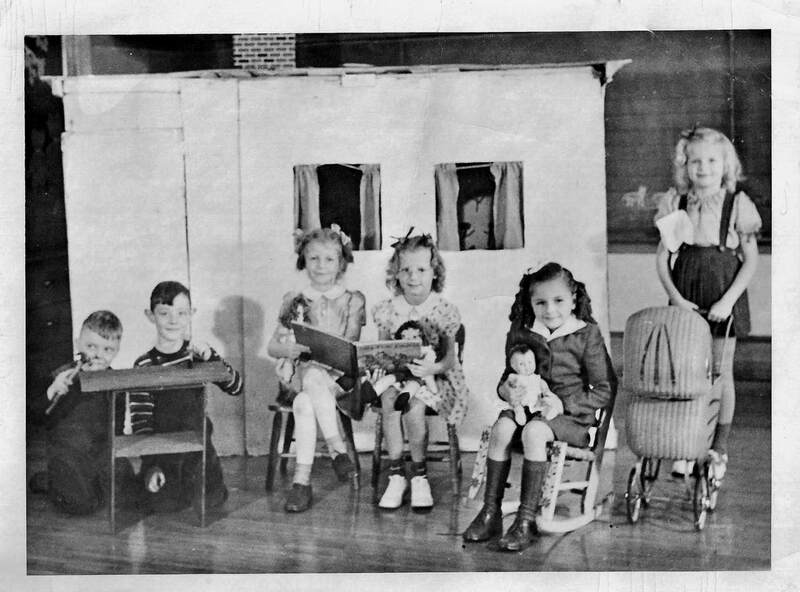 On March 27, the Board passed a unanimous motion to close the Fayal School at the end of the 1946-1947 school year. The Fayal Parent-Teacher Association immediately took action and generated 350 signatures on a petition against the closing of the Fayal School. The Eveleth chapter of the American Jugoslav Association also submitted a letter urging the School Board to reverse its decision. The opposition did not sway the Board. Sometime after that decision, a group called the Order of Saint Charles requested the use of the vacant Fayal and/or Leonidas schools to house displaced Italian families, but this was denied for legal reasons. After the Fayal School closed, Eveleth native Roger Kochevar recalls bouncing balls against the back wall of the school with his friends. The youngsters even managed to get inside and often explored the vacant structure. Roger attended the Franklin School since Kindergarten, but his brother Terry went to the Fayal until he finished second grade. Kochevar also remembers attending Boy Scout meetings under the direction of Scoutmaster Bush at the Fayal. Kochevar also says that a Mr. Gregorich, father of Fayal student David, did not want the Fayal School sitting empty and supported leasing the building to the Oliver Iron Mining Company. While the Fayal School sat empty, plans were in the works to turn it into an office building for an economic powerhouse of the Range: the Oliver Iron Mining Company (OIM). In 1952, the OIM became a division of United States Steel and sought a new location for its ore testing laboratory. Oliver then had three administrative districts on the Mesabi Range: the Canisteo, headquartered in Coleraine; the Hibbing-Chisholm, headquartered in Hibbing; and the Eastern, headquartered in Virginia. OIM chose Eveleth, and the Fayal School specifically, for the new laboratory because of its central location and the availability of a spacious, sturdy facility. The Oliver signed lease arrangements with Independent School District No. 39 in early 1953, and remodeling began that September. The OIM Division altered the former school into a Quality Control Laboratory, where technicians tested and classified ore from every Oliver mine from Mountain Iron to Biwabik. Ore was sampled, crushed, and analyzed for content of iron, phosphorus, silica, and manganese. The Skillings' Mining Review gave special comment to the "new techniques used for analytical and physical studies of the ranges' new iron concentrates." Chemical testing operated 24/7, and results were Teletyped to mines, concentrators, and ore docks. The lab's activities aided company decisions regarding ore extraction, movement, and benefaction. The Quality Control Laboratory was a workspace for 120 mine administrators, clerical staff, engineers, and chemists. Offices were provided for J. M. Johnson, Assistant General Superintendent of the Eastern District; Kenneth McInnis, Spruce Mine Superintendent; Elmer Olson, Spruce Mine Assistant Superintendent; and Iver Lerohl, Chief Chemist. Johnson was also supervisor for the building, which in addition to the laboratory housed the Eastern District's safety and training departments. Oliver Division President R. T. Elstand said, "We feel we have been fortunate to locate these important offices here. The people of Eveleth have aided us greatly in establishing this new facility and we are very grateful to them for their support." I. O. Swanson, General Superintendent of the Oliver's Eastern District, invited the public to an open house at the new laboratory on May 19, 1954. People of Eveleth enjoyed refreshments while touring the remodeled school. 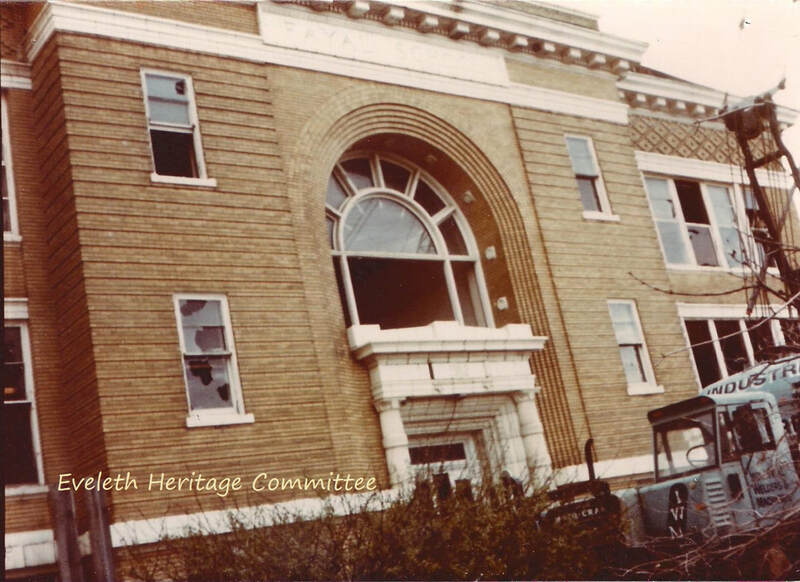 At noon that day, the Eveleth Chamber of Commerce hosted a luncheon at the city auditorium for OIM President R. T. Elstad, company officials, and over 200 members of the public. The mayor and city council welcomed OIM to Eveleth in the May 13 News-Clarion saying, "The people of Eveleth may well be proud of this building." After the Oliver lab closed in the mid-1960s, a company called Ramsgate, which manufactured printed circuit boards, leased the former school beginning in 1968. That operation lasted until the mid-1970s. 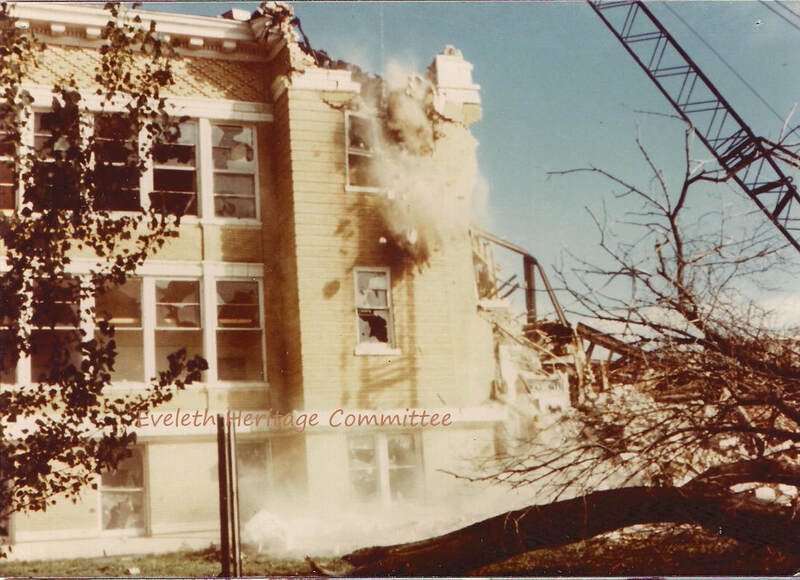 The Fayal School was demolished in October 1977, and the Hilltop Manor apartments were built on that site a few years later. 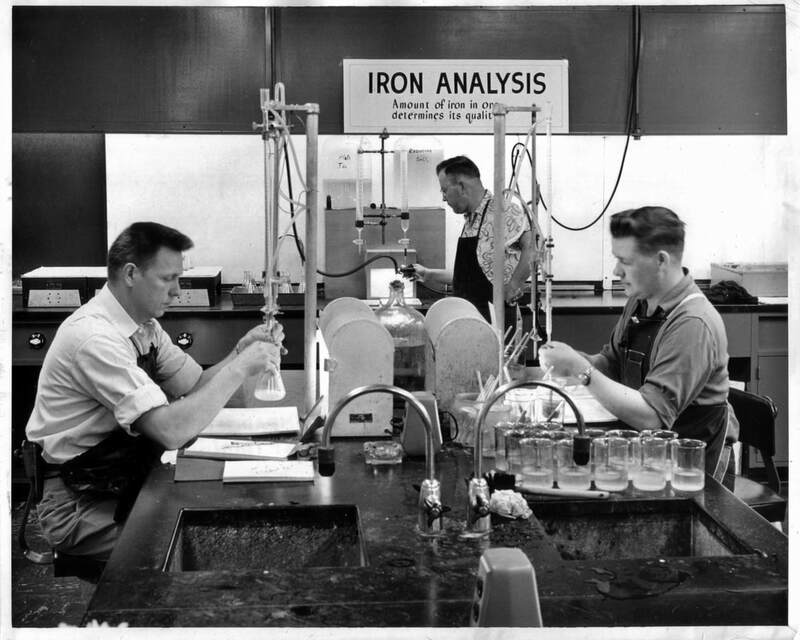 Workers at the Oliver Iron Mining Company's Quality Control Laboratory, 1954. 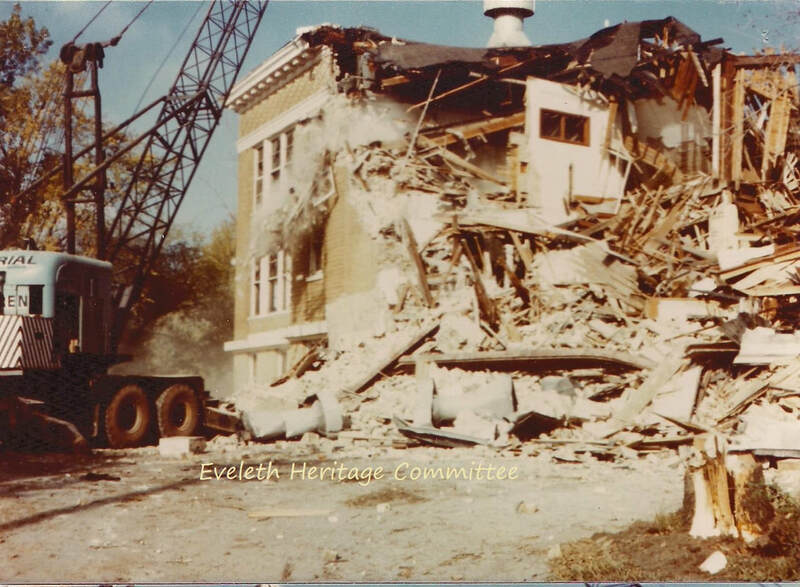 The former Fayal School met the wrecking ball in 1977. ​Some pieces, including bricks, a marble plaque, and pieces of terra cotta, were salvaged during demolition.